The Spring Journal has been mailed and should be delivered shortly. The digital edition is online NOW and avaiable to our digital subscribers. ATP-P Digital subscribers may access the 10th Edition NOW on either their desktop, laptop, or mobile device. Not a subscriber? Sign up now for immediate access to the ATP-P, all published issues of the JSOM, access to our fully searchable compendium of articles, and more! The print version 10th Edition of the ATP-P is available at the online store. Preview the Table of Contents now. The Journal of Special Operations Medicine (JSOM) and Wilderness & Environmental Medicine continue a long-standing shared science program. This opportunity is made possible through a reciprocal partnership between the journals. Selected articles appearing in The Wilderness & Environmental Medicine of interest to readers of the JSOM may be accessed at no cost. Simply click on the WMS logo below to access these articles for free. The OFFICIAL Journal of the Special Operations Medical Association. Overhauling how citizens and medical providers respond to trauma, as well as how they collect and store blood, could save thousands of lives annually. The genus Acinetobacter has long been associated with war wounds. Indeed, A baumannii was responsible for so many infected wounds during Operation Iraqi Freedom that it was given the nickname "Iraqibacter." Therefore, it is important to monitor the occurrence and spread of Acinetobacter species in military populations and to identify new or unusual sources of infection. A junii is an infrequently reported human pathogen. Here, we report a case of a slow-healing wound infection with A junii in a woman on the island of Oahu. This case highlights the pathogenic potential of this organism and the need for proper wound care when dealing with slow-healing wounds of unknown etiology. It also underscores the need for identifying species of Acinetobacter that are not A baumannii to better understand the epidemiology of slow-healing wound infections. Advances in trauma care have accelerated over the past decade, spurred by the significant burden of injury from the wars in Afghanistan and Iraq. Between 2005 and 2013, the case fatality rate for United States Servicemembers injured in Afghanistan decreased by nearly 50 percent, despite an increase in the severity of injury among U.S. troops during the same period of time. But as the war in Afghanistan ends, knowledge and advances in trauma care developed by the Department of Defense (DoD) over the past decade from experiences in Afghanistan and Iraq may be lost. This would have implications for the quality of trauma care both within the DoD and in the civilian setting, where adoption of military advances in trauma care has become increasingly common and necessary to improve the response to multiple civilian casualty events. This report documents the remarkable decrease in casualties killed in action during the wars in Iraq and Afghanistan and the role of the Joint Trauma System, the CoTCCC, and the TCCC Working Group in helping to make that happen. It also outlines a clear and comprehensive vision for a National Trauma System that will enable the civilian and the military sectors to work in concert to help prevent ALL potentially preventable deaths in trauma victims. I just finished reading the fall edition of the JSOM and I am completely blown away!!!! It is absolutely packed with exceptional and relevant information that without a doubt, will assist SOF Tactical Health Care professionals in providing relevant and evidence based patient care. Thank you for providing what I consider a "World Class Medical Journal". The journal itself and the website have become my primary resource for knowledge in tactical medicine." 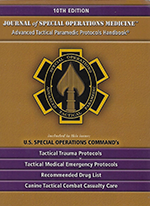 "There is no peer-reviewed academic resource that equals the Journal of Special Operations Medicine for support of the medical and veterinary lead in Stabilization, Security, Transition and Reconstruction (SSTR) operations, combat and field medicine, and adaptation of Tactical Combat Casualty Care into Tactical Emergency Casualty Care for the law enforcement and emergency management community in 195 UN member countries. JSOM is a valuable resource as we continue the Millennium Medicine Project, targeting the global population that lacks access to basic surgical services and providing crisis management, security, and defense support in this demographic." "Military units that have trained all of their members in Tactical Combat Casualty Care have documented the lowest incidence of preventable deaths among their casualties in the history of modern warfare - and JSOM is the first journal to publish every new change in TCCC." "The past 30 years has brought an amazing professionalization of the specialty of Tactical Emergency Medical Support (TEMS). As new standards are set and the world faces increasingly complex security challenges, it is critical that the front line medical providers supporting military, intelligence, and law enforcement operations have a mechanism to expand their knowledge and share best practices. 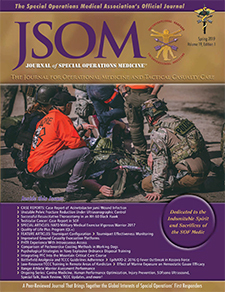 The Journal of Special Operations Medicine offers civilian readers access to the most cutting edge developments in the field including updates on Tactical Emergency Casualty Care (TECC), the National TEMS Imitative and Council (NTIC), and combat lessons learned. 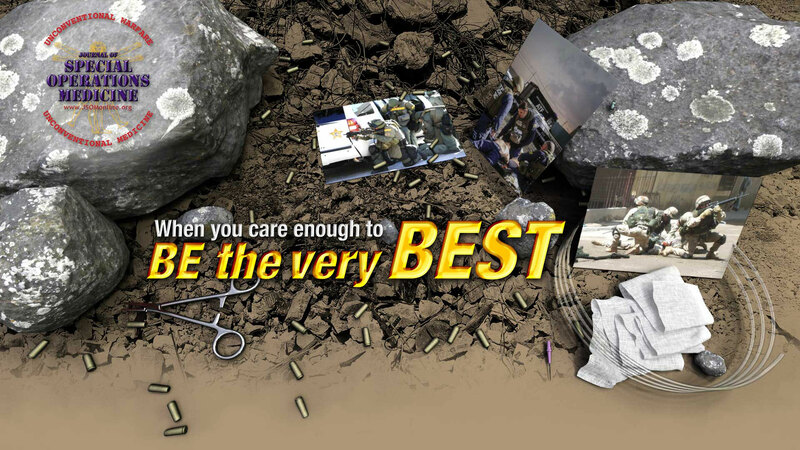 JSOM is the one-stop shop for best practice and future advancements in civilian TEMS. One of the unifying principles across humanitarian, expedition and disaster response medical operations is the ability to make complex decisions in uncertain environments. The Journal of Special Operations Medicine is one of the most unique platforms for experts to convey lessons learned and relevant scientific advances across specialties that historically have little interaction. Whether you work for Doctors Without Borders, a DMAT, or provide medical support for expeditions in austere environments, Journal of Special Operations Medicine is your journal."